Minnesota is set to meet its carbon emissions targets under the Clean Power Plan even if the rule goes away under executive action signed Tuesday by President Trump, state officials said. The federal regulations curbing carbon emissions from existing power plants directed Minnesota to reduce those emissions by about 40 percent by 2030. Utilities are on pace to do that, thanks to changing energy economics, said David Thornton, an assistant commissioner at the Minnesota Pollution Control Agency. "Goals and targets that two or three years ago seemed unreachable are, all of a sudden, business as usual," he said. "I would not be surprised if that trend continues." Wind and solar energy are getting cheaper, and there's excitement over the possibility of batteries to store renewable energy. Corporations, local governments and some state governments are embracing clean energy both for economic reasons and because it's better for the environment. The utilities, which make plans about how to best generate power decades into the future, are choosing less coal. "A number of power companies are saying, 'We're going to be planning for a lower carbon future because we know that's inevitable,'" said Gabe Pacyniak, mitigation program manager at the Georgetown Climate Center. Overall, Minnesota generated roughly 44 percent of its electricity from coal in 2015, according to the Energy Information Administration. The plans of Minnesota Power, Otter Tail Power and Xcel Energy — the state's three investor-owned utilities — to embrace more wind energy will mean less coal arriving on trains from Wyoming and Montana. Minnesota Power aims to generate a third of its energy from coal, a third from renewables and a third from natural gas by 2030. As recently as two years ago, coal was generating 75 percent of the utility's power. "We constantly see changes in our political landscape, they ebb and flow, but the requirement to serve our customers in a reliable way with affordable energy stays the same," said Julie Pierce, vice president of strategy and planning for Minnesota Power. "Our transformation is going to continue." Still, some Minnesota electricity customers also get power generated from coal plants in North Dakota and South Dakota. That's one area where federal policy can make a difference, said J. Drake Hamilton, science policy director with Fresh Energy. "Unless we have a level playing field across the country, we're not going to see the speed and depth of the climate action that scientists say we need," she said. 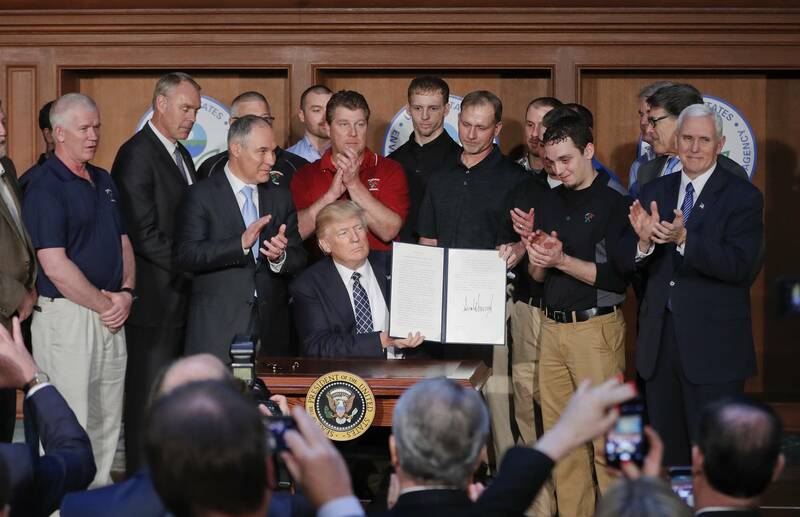 In announcing his executive order rolling back several of former President Barack Obama's climate change policies, Trump told more than a dozen coal miners he was putting them back to work. But it's not that simple. Changing the Clean Power Plan requires a lengthy rulemaking process that will undoubtedly be met with lawsuits by environmentalists. And then there's the changing energy economics. "It's a good talking point for this administration, but from a practical standpoint, no one is going to change their behavior," said state Rep. Pat Garofalo, R-Farmington, who oversees the House energy committee. "The combination of wind and natural gas on price, pollution and productivity are just trouncing every other energy source. And this executive order won't change that." But it's still an open question whether this economic reality or Trump's rhetoric about bringing back coal will be the message received by nations around the world. "A lot of it is about norms and being symbolic, and having something credible behind it," said Gabe Chan, a professor at the University of Minnesota's Humphrey School of Public Affairs who has been observing the international negotiations around climate change. "Certainly in the countries of the world where global emissions are rising fastest, it really matters how those countries perceive the kinds of action the U.S. is taking," he said. "When the administration comes forward and talks about climate change like the science is uncertain, I think it makes it a lot harder for those countries to build the domestic case to do anything there." Meanwhile, evidence of a changing climate keeps piling up. For Minnesota, it means fewer pond hockey days, longer ragweed seasons and heavier rainstorms that wreak havoc on farm fields, highways and homes. "Climate change is not simply a global problem," said Minnesota Pollution Control Agency Commissioner John Linc Stine. The agency held listening sessions statewide on the Clean Power Plan, and Stine said Minnesota's youngest residents consistently urged action. "We heard loud and clear from the future generation: Take steps forward on climate change. Don't stop debating this," he said.